Would you like your listing to stand out from all the rest? Make it a YELLOW PAGE AD. Here's how it works. See those six yellow page pad graphics at the top of this page? Each of them links to a full page Product Presentation advertorial, or directly to advertiser's website. When you sign up for a Yellow Page Ad, your ad is rotated through most of the pages on our site. 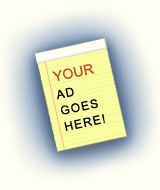 Ads are rotated once a day, through over 1,000 web pages on our well-trafficked site (nearly 1000 visitors per day). That's over 6,000 spots where your ad can appear. Each Product Presentation advertorial is featured on its own page, and can contain up to 5 images. We also construct the code for your page in a way that enhances its chances for a good listing on the major search engines. Click here to see an example of a Product Presentation. Product Presentations should be in the mode of an infomercial, with the accent on information (rather than hype). NOTE: This example illustrates the kind of sophisticated page you can create using our product presentation editor, if you have some web design experience. However, you don't need any web design experience to use our editor create an attractive and effective advertorial.